Seventy percent of the cocaine consumed in the United States passes through the Eastern Pacific, and in recent years, the Coast Guard and its mission partners have been increasingly effective at finding and seizing these illegal shipments. 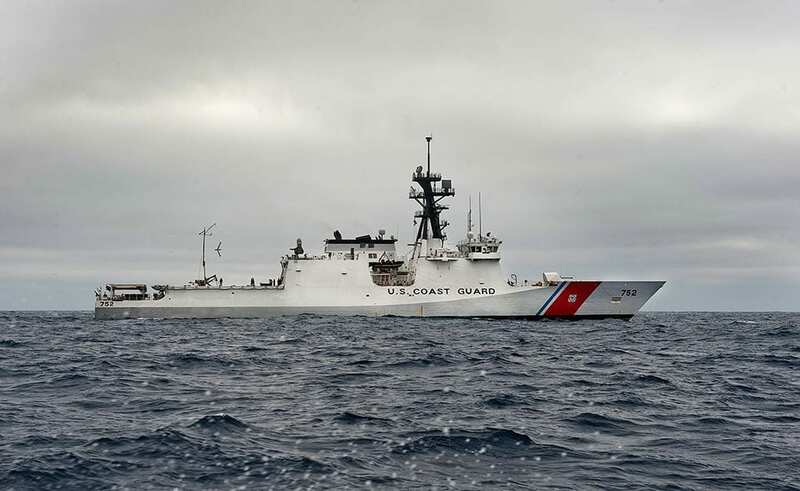 By the time the Coast Guard National Security Cutter Stratton had returned from its six-week patrol of the Eastern Pacific Ocean in early April 2017, it had seized more than $50 million worth of cocaine and apprehended 10 suspected drug traffickers. According to Cmdr. Dan Broadhurst, UAS division chief in the Coast Guard’s Office of Aviation Forces, the addition of these capabilities transformed Stratton’s on board combat information center from a radio room into a full-motion video experience. It wasn’t a record haul for a national security cutter (NSC) patrol, but the Stratton’s recent voyage stands out as a milestone for the service: It was the first in which drug seizures were directly assisted by a cutter-based unmanned aircraft system (UAS). 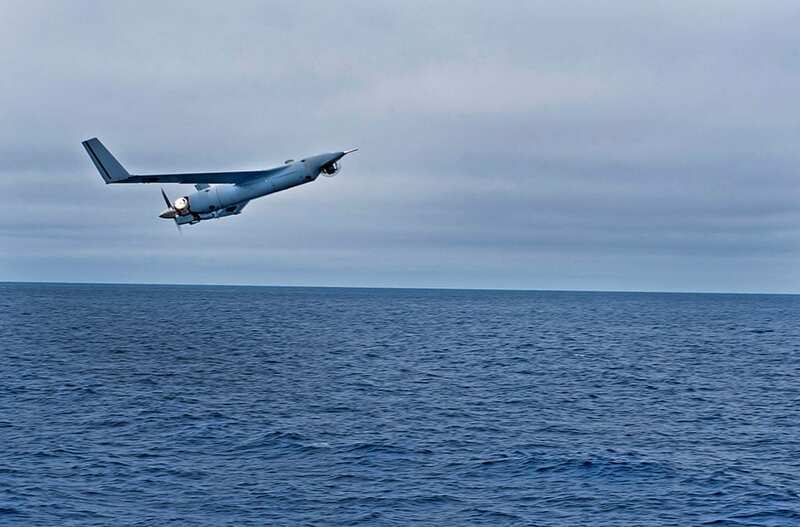 The ScanEagle®, a 44-pound fixed-wing craft launched from a catapult aboard the Stratton, flew 39 sorties, providing maritime surveillance through multiple sensors, including telescoping cameras and a turret-mounted electro-optical/infrared (EO/IR) imaging system. With a range of a little more than 60 miles, the ScanEagle was able to relay video and data about targets of interest to the Stratton’s crew. According to Cmdr. Dan Broadhurst, UAS division chief in the Coast Guard’s Office of Aviation Forces, the addition of these capabilities transformed Stratton’s on board combat information center from a radio room into a full-motion video experience. The national security cutters, which have been in service since 2008, have always been envisioned as platforms for unmanned aerial systems – but for a number of reasons, settling on what such a system would look like has been a painstaking process. The Coast Guard first envisioned an NSC-based vertical takeoff/landing (VTOL) UAS, capable of using cutter helipads, but the program that funded that effort has undergone serious restructuring, and the service has struggled to fund its own dedicated UAS program. In 2015 and 2016, Congress appropriated funds for the Naval Air Systems Command (NAVAIR) that allowed the Coast Guard to establish a program known as the small unmanned aircraft system for the national security cutter, or sUAS for NSC. This funding enabled the service’s choice of the ScanEagle, manufactured by Boeing subsidiary Insitu, as the prototype system. The service contracted for two 105-day deployments per year. In its draft RFP, the service specified that it wants the new medium-range UAS to be able to be launched and recovered from aboard a cutter, have an endurance of 12 hours, operate EO/IR cameras, and have day and night capability. In spring 2017, as the ScanEagle completed its successful voyage, the Coast Guard issued a draft request for proposals (RFP) for a medium-range UAS, for use on its Legend-class NSCs. As Broadhurst pointed out, the service’s aviation leaders don’t think “small UAS” (sUAS) is a good descriptor for this system; they prefer to classify the coming generation of unmanned systems in the same way their other air assets are classified: as short-, medium-, and long-range. In its draft RFP, the service specified that it wants the new medium-range UAS to be able to be launched and recovered from aboard a cutter, have an endurance of 12 hours, operate EO/IR cameras, and have day and night capability. While the ScanEagle has performed well, Broadhurst described the sUAS for NSC program as a “laboratory for growing a larger program.” It’s an open competition to determine who will build the Coast Guard’s medium-range UAS, and Insitu will surely be a strong contender – but the new medium-range UAS will need to satisfy new Coast Guard-specific requirements, said Broadhurst. The funding mechanism used to create the sUAS for NSC program – a discretionary defense appropriation, routed through NAVAIR – meant that many of the ScanEagle’s technical specifications were matched to the Navy’s needs. One of most important things to note about the draft RFP, Broadhurst said, is that it signifies the Coast Guard has “a controlling stake in our own destiny, being able to write our own contracts and make modifications as we need to, because our mission is fundamentally different than that of Navy and other services.” After a period of receiving input on the draft, the full RFP is anticipated in late 2017. The Coast Guard anticipates the contract for the medium-range UAS will be awarded in the second half of the 2018 fiscal year. Under the arrangement, the Coast Guard, if it identifies the need for a Predator B in fulfilling mission requirements, requests the use of a UAV from the CBP. In spring 2016, Rep. Duncan Hunter, R-Calif., chair of the House Subcommittee on Coast Guard and Maritime Transportation, sent a letter to the CBP in which he questioned how well this arrangement was working out for the Coast Guard and requested information on the service’s requests. The CBP’s own demand for UAV capabilities, Hunter wrote, often rendered it unable to provide consistent support for the service. While careful not to assign blame – the Predator B is a valuable asset, in high demand – Hunter nevertheless suggested it was time for the Coast Guard to begin acquiring its own fleet of long-range UAVs. For now, the only UAS program with full congressional funding is the sUAS for NSC program. “We anticipate that being the springboard to get us into everything else,” Broadhurst said. Broadhurst and the Coast Guard don’t have an opinion about whether this is a necessary step. “Some people see benefit with the Coast Guard going their own way,” he said, “and others see benefit in continuing to strengthen the joint program. … If we’re talking about leaving the joint program right now, we have another five to 10 years of hard work in front of us while we build up the infrastructure, the people, the logistics – everything that you need to run an organic UAS program.” There would also be complex issues to be resolved about the service’s use of the national airspace. It’s understandable, Broadhurst said, that some would consider being “benched” for five years, while a new long-range UAS program is built from scratch, a less attractive option than increasing support, in the form of people and money, to the existing joint program. For now, the Coast Guard is doing what it does best when faced with such a dilemma: It’s carefully studying its options. The 2018 budget proposal, meanwhile, contains start-up funding for research and development of a land-based long-range UAS for the service.